I did join the 2013 Goodreads challenge, because now I can actually read what I want (for the most part...I do have some projects that require me to read certain things). So, even though I didn't meet my last goal, I upped my book goal to 75. This means that I won't be reading a lot of really long books, of course, but I am determined to succeed! I actually have already read one book: The Chocolate Money by Ashley Prentice Norton. 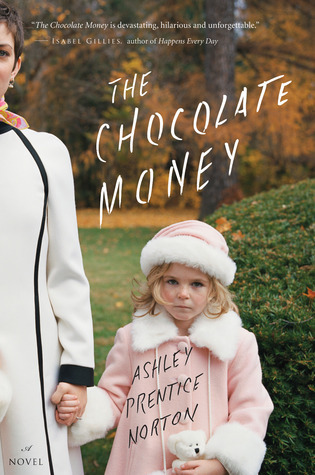 Set in 1980s Chicago and on the East Coast, this electric debut chronicles the relationship between an impossibly rich chocolate heiress, Babs Ballentyne, and her sensitive and bookish young daughter, Bettina. Babs plays by no one’s rules: naked Christmas cards, lavish theme parties with lewd installations at her Lake Shore Drive penthouse, nocturnal visits from her married lover, who “admires her centerfold” while his wife sleeps at their nearby home. PS: As for that last sentence...yeah...maybe it is like Mommie Dearest and Prep, but don't buy this expecting anything close to 50 Shades. I am so sick of books using that as a marketing tool. Ugh. I mean, there is a new edition of Shirley Conran's Lace...and on the cover, it says that if you loved 50 Shades you will love this early novel. Lace is NOTHING like 50 Shades. But I digress. I really enjoyed reading The Chocolate Money. It is very "readable," but it is not for the faint of heart or someone looking for a story to make them feel a warm and fuzzy inside. The narrative voice is very strong, and Bettina is a believable flawed character put into sometimes incredibly unbelievable situations. The book is a coming of age story about Bettina as she grows up with a completely neglectful and abusive mother (who happens to be heiress to an enormous chocolate company fortune). Anyway, I really liked it and, as dark as it was, it left me satisfied. Plus, the cover absolutely rocks. What I didn't like is that some of the cultural/popular references to dress and products in the early 80s didn't ring true to me. So many times I felt as if the author were trying to modernize the story in ways that she didn't need to do. I also found certain situations unbelievable--especially Bettina's life at the end of the book. I just don't buy it. I won't spoil anything for you, but there it is. In any case, I did enjoy reading the book...so much so that I read it nearly in one sitting. As I mentioned, be warned that the book is explicit and doesn't censor anything. So, if you want a dark bildungsroman, go for it.